New Paper That Further Documents A Muted Atmospheric Water Vapor Trend – “Surface Water Vapor Pressure And Temperature Trends In North America during 1948-2010” By Isaac and Van Wijngaarden 2012 | Climate Science: Roger Pielke Sr. 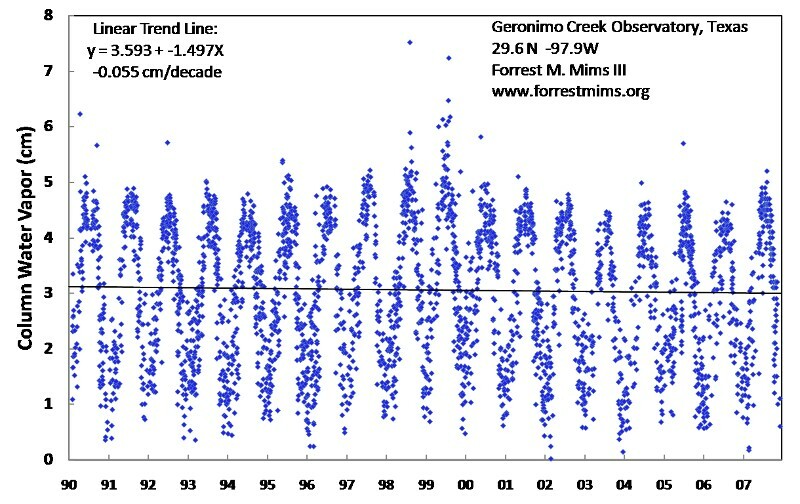 Figure by Forrest Mims III from his website Sun and Sky Data. The amplification of the radiative effect of the addition of CO2 and other human-emitted greenhouse gases into the atmosphere requires the addition of water vapor to the atmosphere which is assumed to occur primarily from warmer ocean surface temperatures (thus elevated evaporation). However, this increase of water vapor, at least in recent years is either not occurring or is very muted from the predictions made by the IPCC multi-decadal global model predictions. Sun, De-Zheng, Yongqiang Yu, Tao Zhang, 2009: Tropical Water Vapor and Cloud Feedbacks in Climate Models: A Further Assessment Using Coupled Simulations. J. Climate, 22, 1287–1304. The new Isaac and van Wijngaarden 2012 paper adds to these studies and is yet another documentation of the inability of the multi-decadal global model predictions of the IPCC to skillfully predict even such a basic component of the climate system as the long term water vapor feedback.